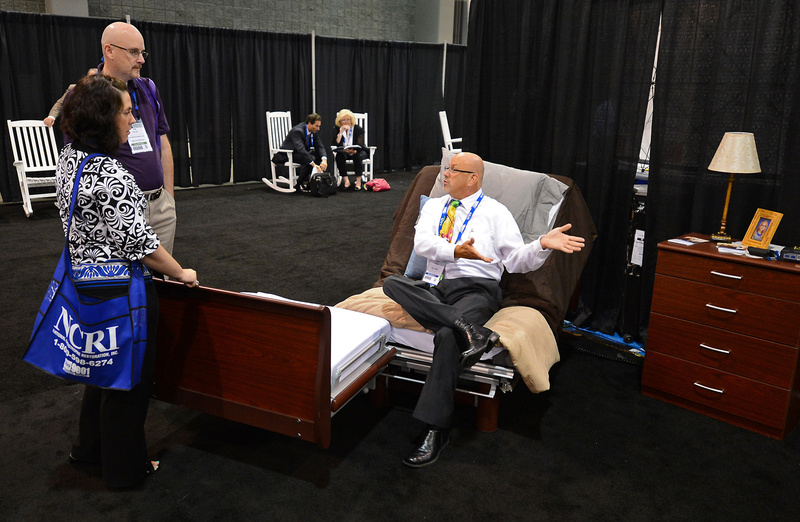 John Stern of Hill-Rom demonstrates a bed during a convention of assisted living executives in Charlotte, N.C., on May 8. The economy is slowly recovering, home values are rising again, and baby boomers are turning 65 at a rate of nearly 10,000 a day. Leaders in the senior living industry hope these factors add up to more older Americans selling their homes and moving into assisted living communities over the next decade. How to capture that business was the focus of Assisted Living Federation of America’s recent conference in Charlotte, N.C., which drew nearly 2,300 participants. Workshop discussions offered insight into what consumers should know when choosing a community – from the prevalence of online reviews, to sales teams offering breaks on rent to drive occupancy. To draw more business, industry leaders are working hard to change the image of assisted living. Instead of thinking of them as care facilities, leaders want prospects to view communities as vibrant, active places. The sector known as senior housing and care has a market value of $300 billion and growing, according to National Investment Center for Seniors Housing and Care Industry, a Maryland-based group that compiles data for investors. Assisted living is one of the fastest-growing long-term-care options for seniors. Center data suggest nearly 600,000 people reside in assisted living units across the country. Such places offer long-term living arrangements that combine housing, support services and health care. They also feature daily activities, from Bible study to trivia games, and regular outings for local shopping and dining. Average monthly cost of a one-bedroom apartment is $3,022, according to the Assisted Living Federation of America. That price doesn’t include other care fees, such as help with medications or showers. It’s a cost that gives many people pause before signing contracts. But shoppers do have an edge: Within communities, the pressure is on to keep occupancy rates high. Occupancy rates are slowly inching back toward prerecession levels, industry leaders said. One possible reason: In the improving economy, more people may be willing to sell their homes now to pay for care. But people are still reluctant to change their lifestyle, especially if they are not sick, speakers said. Focus groups of prospective residents overwhelmingly show that people do not want to live in seniors housing, said Margaret Wylde of Oxford, Miss.-based ProMatura, a market analysis group specializing in 50-plus consumers and their housing. Wylde said other options pose strong competition, including “granny flats” on adult children’s property, home health care and multigenerational housing. Trends show people are holding out as long as they can before choosing assisted living, said Bild, the senior housing consultant. To persuade hesitant prospects, salespeople should be encouraged to spend more time talking to prospective residents and their families, Bild said. People who know and live within assisted living communities should be encouraged to give referrals. And places may do things differently to change visitors’ first impressions. Walking in and seeing residents socializing, as opposed to being silent on couches, could make a difference. Most younger Americans aren’t clear how to pay for that option in their retirement, said Andrew Carle, with the senior housing administration program at George Mason University, during a workshop on long-term care financing. Citing a 2006 AARP survey on financing perceptions, Carle said more than half of 1,800 polled mistakenly believed Medicare would cover that cost. But the federal health insurance program doesn’t pay for assisted living. Medicaid covers some assisted living options in some states, but financial requirements are stringent, including spending down savings. That leaves it up to the senior housing industry to promote long-term care insurance, which would help cover assisted living costs, workshop speakers said. But efforts to launch a national long-term care insurance program proved politically tough, said national health and disability policy expert Connie Garner with the law firm Foley Hoag. A provision for a national program was eventually dropped from President Barack Obama’s Affordable Care Act. And several private insurers no longer offer long-term care insurance, scared off by the high cost of claims. Turning that around may involve changing impressions about assisted living’s worth, Carle said.